A community design charrette is an intense period of design activity undertaken in a community in order to create a new, visual direction for that place. The process involves collaboration among many stakeholders in the community with a team of design experts. Community involvement is sought at many different times during the charrette, but typically involves at least three feedback loops, when the design team stops working to present their work to the public. The public gives the team their positive and negative feedback, which is incorporated into the direction the design team takes from that point forward. While the team keeps the principles of design in mind throughout the charrette, they are careful to recognize that the preferences of the community are vital to a successful design visit. At the end of the charrette, the design team presents the community’s final visual plan for the future at a community gathering. The drawings created by the design team are left behind for the community to use as they work on bringing the community’s new vision to life. 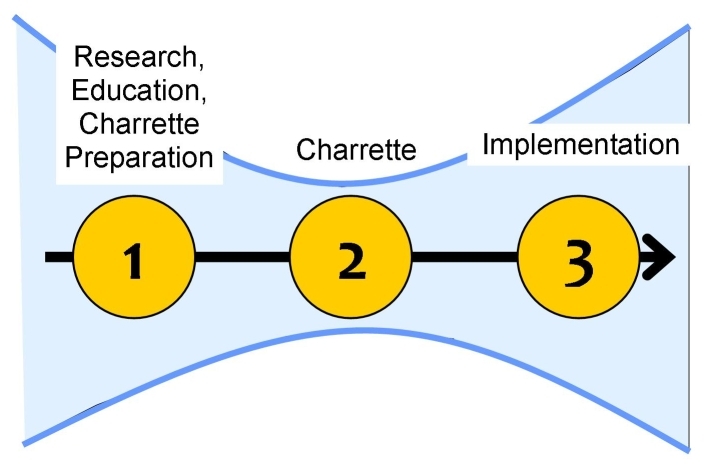 Learn more about charrettes from the National Charrette Institute.